OSU freshman wrestler Kyle Snyder walks away after pinning a Missouri wrestler Dec. 14 at the St. John Arena. OSU lost, 20-19. The Ohio State wrestling team improved to 9-3 overall and 5-1 in the Big Ten after defeating the Maryland Terrapins, 31-9, in College Park, Md on Sunday. Redshirt-freshman Nathan Tomasello (125 pounds) got things started for the fourth ranked Buckeyes when he defeated Terrapins’ redshirt-junior Josh Polacek with a 15-0 technical fall in the second period. At 133 pounds, OSU redshirt-junior Johnni DiJulius bounced back after being taken down in the first period by Maryland’s redshirt-junior Geoffrey Alexander by scoring 10 straight points to give himself a 10-2 majority decision win. OSU redshirt-senior Logan Stieber continued his pinning ways against sophomore Shyheim Brown when he was able to get the fall with just six seconds remaining in the second period. Stieber led Brown 9-2 before earning his ninth pin of the season. The top-ranked 141 pounder is 17-0 on the season and 107-3 in his career. Redshirt-senior Randy Languis kept the Buckeyes rolling as he defeated redshirt-senior Ben Dorsay via decision. His 3-1 victory at 149 pounds gave OSU an 18-0 match lead. After going scoreless in the first four matches, Maryland got on the board after redshirt-junior Lou Mascola defeated redshirt-junior Kyle Visconti at 157 pounds. The victory for the Terrapins was short lived as redshirt-freshman Bo Jordan needed just one minute to pin redshirt-sophomore Tyler Manion in the very next match. Jordan is ranked fifth nationally and is 11-0 on the year. Maryland got its second win of the match when redshirt-junior Josh Snook defeated redshirt-freshman Dominic Prezzia 6-0 at 174 pounds, making it 24-6 in favor of the Buckeyes. OSU was able to answer Maryland and regain the momentum once again as redshirt-junior Kenny Courts blanked his opponent, redshirt-senior Tony Gardner, 7-0, at 184 pounds. 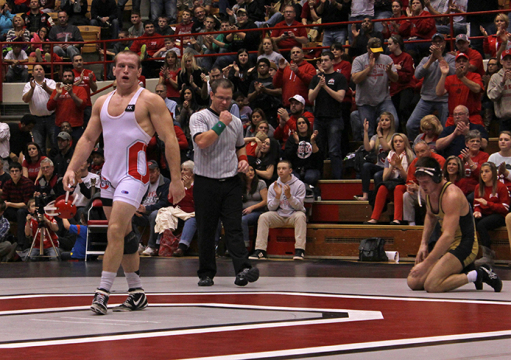 The 197-pound match featured a homecoming for OSU’s freshman Kyle Snyder. Snyder, who won via major decision, 18-7, on Friday against Indiana said before the match that he wanted to impress his family and friends that would be in attendance. The Woodbine, Md., native took down redshirt-senior Rob Fitzgerald on his way to another major decision, this time 17-9. Snyder is ranked fifth nationally and hopes his individual success will help the team achieve its goals, he said. OSU senior Ray Gordon dropped the final match 1-0 to redshirt-senior Spencer Myers. 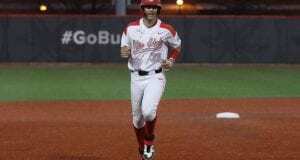 On Friday the Buckeyes defeated the Indiana Hoosiers, 31-13, at Norwalk High School. The Buckeyes used three pins and five wins via bonus points to capture the match. Norwalk held the meet in honor of Logan and Hunter Stieber, who are Monroeville, Ohio, natives. Logan Stieber was able to pin Sean Brown in just 2:14 in front of the home crowd. Fifth ranked Bo Jordan won a key match against seventh ranked Taylor Walsh that got things started for the Buckeyes and their 62 point and two win weekend. OSU is set to take on Purdue on Friday in Columbus with wrestling scheduled to begin at 7 p.m.